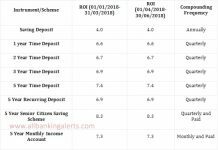 Know about National Saving Certificates (NSC) Eligibility, Categories of Holding, Interest Rates, Tenure, Tax Benefits, Nomination, Maturity Value Calculator and other features. National Saving Certificates, popularly known as NSC, is a tax saving investment option available for Indian residents. NSC can be purchased from any post office and is backed by Government of India. It is safe and offer fixed return. It is primarily used for small savings and income tax saving purpose. NSC is best for risk-averse investors who are looking for fixed return instruments. Here in this article, we will discuss the NSC in details and explore its key features and benefits. National Saving Certificates (NSC) is fixed return instrument which can be purchased from any post office in India. Like, Public Provident Fund (PPF), Kisan Vikas Patra, NSCs are also backed by Government of India so they are less risky and safe. It is usually preferred for small saving or medium income investors. 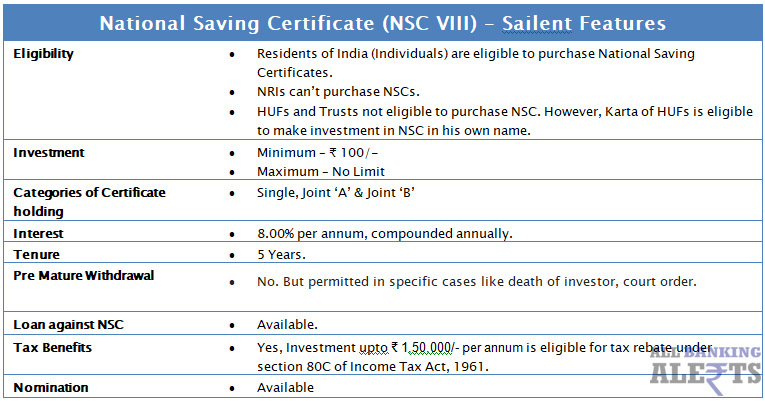 Earlier, National Saving Certificates (NSC) were available in two tenures – 5 years (NSCVIII) and 10 years (NSC IX). NSC (IX) was discontinued in December 2015 and now only NSC VIII is available for subscription. Single Holder Type Certificate – Single holder type certificate can be purchased by an adult for himself or on behalf of a minor or by a minor. Joint A Type Certificate – Joint A Type Certificate is held by two investors with equal share on maturity. Signature of both the investors will be required for transfer, cancellation or even nomination. Joint B Type Certificate – In Joint B Type Certificate category, maturity proceeds can be paid any one of two account holders. Residents of India (Individuals) are eligible to purchase National Saving Certificates. NRIs can’t purchase National Saving Certificates. HUFs and Trusts not eligible to purchase NSC. However, Karta of HUFs is eligible to make investment in NSC in his own name. Maturity Period of NSC is 5 Years. Earlier, NSCs were available with two maturity periods – 5 years and 10 years. But 10 years NSC is discontinued now. Investment in NSCs offer you interest rate @8 percent per annum compounded annually and payable at maturity. However, Interest rates are now decided quarterly. So, you must check the current rates of post office NSC before proceeding to purchase the NSC. For example, If Mr. Deepak invested ₹ 10,000/- in NSC. It will grow to ₹14,693/- after 5 years. The investment upto 1.5 lakh in National Saving Certificates (NSCs) qualify for tax rebate under Section 80C of Income Tax Act. Interest earned on investments in NSCs in first year are also added with initial investment and qualify for tax rebate in second year. Submit the dully filled in form along with Xerox copies of KYC documents(ID Proof, Address Proof, Passport Size Photographs). Make the initial deposit by cash/cheque. Post Office will process your NSC application form and print the certificate of that amount which you can collect from the post office. NSC certificates can be kept as collateral security with Banks or NBFCs for loan. Post Master put a transfer stamp on certificate and transfer it to the bank. Nomination facility is also available in NSC. Investor can nominate any person or family member while applying for national saving certificate. So, National Saving Certificates (NSC) is a good investment option for risk-averse investors. There is no limit on amount you invest and even tax exemptions also available under 80C. You can consider investing in NSCs based on the purpose of savings or as per financial goal. If you found this article useful, share with your friends or colleagues who might want to know about NSCs and invest in it.